Scotland Club XV and Heriot’s head coach, Phil Smith, has included seven Borders players in his team to face England Counties at Netherdale on Friday, February 26 (7.30pm). The team includes many players from club sides who have dominated the BT Premiership this season with Ayr’s Ross Curle named as captain in the centre. Smith has awarded new caps in both the backs and forwards, including Hawick’s Lee Armstrong while in-form forwards Ross Graham (Hawick) and Nick Beavon (Melrose) are selected up front. Melrose’s Fraser Thomson will fill the 15 shirt with teammate Sam Pecquer providing pace on the wing. Jamie Bhatti and Neil Irvine-Hess, also from Melrose RFC, are named on the bench. Smith said: “We’ve named a side with many new faces but have retained some experience from last year’s campaign. The match against England Counties will be the first of two international games with Scotland Club XV travelling to Cork to face Ireland Club XV on Friday, March 18. Tickets are £12 (adult entry to the match) with seniors, under-18s and Scotland Season Pass holders free. Tickets are available to buy from http://www.scottishrugby.org/tickets or you can pay on the gate. 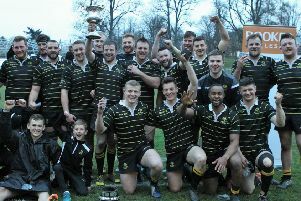 Club XV team to play England Counties at Netherdale, Galashiels, Friday 26 February, (kick-off 7.30pm): Fraser Thomson (Melrose); Sam Pecquer (Melrose), Ross Curle CAPTAIN (Ayr), Brendan McGroarty (Glasgow Hawks), Jordan Edmunds (Boroughmuir); Lee Armstrong (Hawick), Paddy Boyer (Glasgow Hawks); George Hunter (Ayr), Ross Graham (Hawick), Nick Beavon (Melrose), Robert McAlpine (Ayr), Jack Turley (Heriot’s), Jason Hill (Heriot’s), Will Bordill (Ayr), Peter McCallum (Ayr). Subs: Michael Liness (Heriot’s), Struan Cessford (Heriot’s), Jamie Bhatti (Melrose), Russell Nimmo (Heriot’s), Neil Irvine-Hess (Melrose), Graham Wilson (Heriot’s), Cameron Ferguson (Heriot’s), Harvey Elms (Currie).